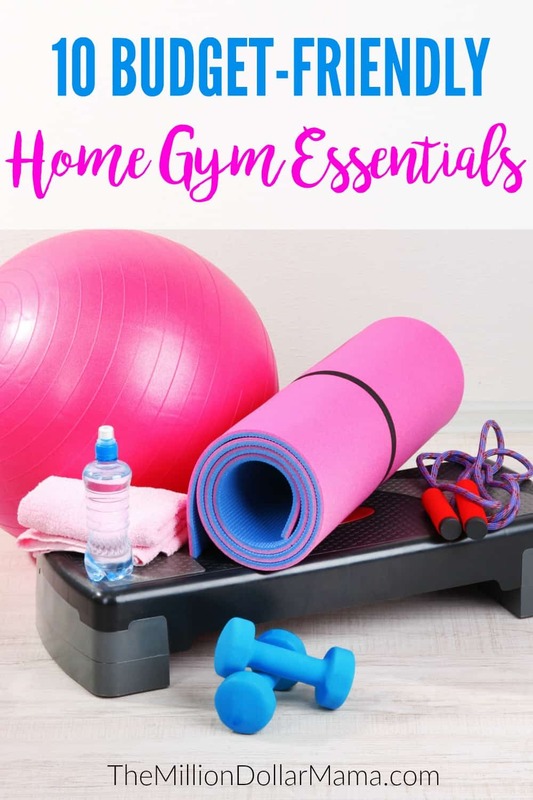 Are you planning your create a home gym on a budget and want to know the budget-friendly home gym essentials you need to have? 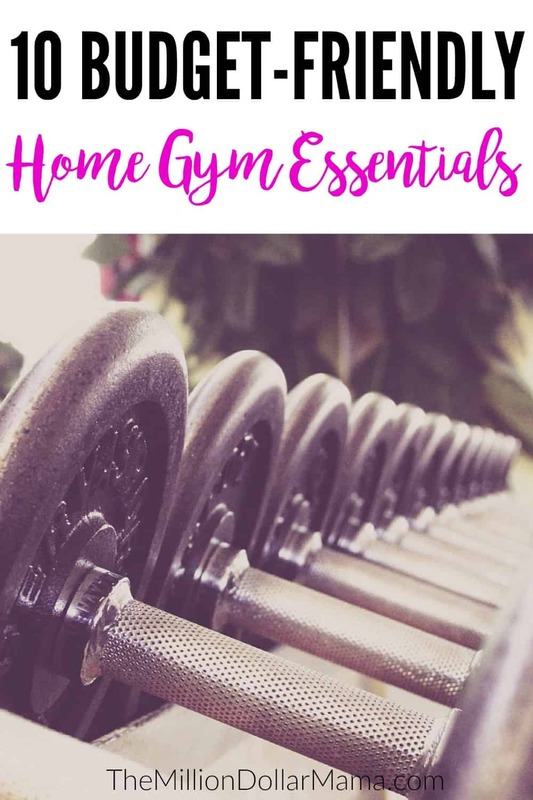 I created my own home gym a few years ago – read on to find out my home gym must-haves! We’ve since moved to a new state, I have a gym membership, and we no longer have a large bonus room. However, I’ve kept my home gym! Because I don’t have large gym equipment a huge room isn’t required, so our spare bedroom is perfect. You could even set this up in your garage if you don’t have a spare room. In fact, you don’t even need an entire room – even a space in the living room would work. And even though I have a gym membership, I still find it handy having a home gym. The gym I attend offers childcare but if my little isn’t feeling well, or if the childcare is closed, if we have a snow day, etc., it’s good to know that I can still get my workout in! Here are 10 budget-friendly home gym essentials that will help you get in an effective workout from home. No home gym would be complete without a set of dumbbells. To get toned arms, dumbbells are essential. I love these Cast Iron Hex Dumbbells – depending on your current strength level, I’d recommend starting with two pairs of different weights, maybe a 10lb pair and a 15lb pair. That way you can work out bigger muscles like your biceps and smaller muscles like your triceps. A floor mat is a great item to have for your home gym for ab exercises like planks and for yoga and stretching. I really like this YogaAccessories Deluxe Yoga Mat because it has a double-sided non-slip texture and it’s thicker and longer than normal yoga mats. A stability ball is a great all-rounder (no pun intended 😉 ) to have in your home-gym. A stability ball can help you target lots of areas including your abdominal muscles and core, upper and lower back, legs, and upper body. It’s important that you choose the right sized stability ball for your height. These professional grade Black Mountain Stability Balls come in five different size options, four different colors, and include a pump. Resistance bands are an excellent addition to any home gym because they offer endless workout potential. Resistance bands can provide a full body workout, targeting biceps, triceps, chest, abs, core, and legs. I love this Black Mountain Resistance Band Set – the set comes with a lifetime warranty and includes a door anchor, carry bag, exercise chart, ankle strap and starter guide. Bosu balls are amazing for increase core strength, balance, flexibility, and coordination. This RitFit Bosu Ball is a great option because it comes with detachable resistance straps, a hand pump and a wall chart with example exercises. A gym is not a gym without a barbell set. Barbells are cost effective, and incredibly versatile – there are endless exercises you can do with a barbell – deadlifts, calf raises, bent-over rows, barbell curls, ab rollouts… The actual plates themselves can be used for many different exercises, too. A lot of barbells are sold by themselves (you then have to buy the plates) which is why I like this Gold’s Gym barbell set – the plates are included. I’m not a big fan of Step Aerobics classes, but I still believe that an aerobic step is still a great addition to any home gym. An aerobic step can be used for calf raises (I hold onto two dumbbells for an even greater workout,) tricep dips, pushups, bench dips, and barbell tricep extensions. This Step Original Aerobic Platform comes with two risers so you can easily adjust the height, and has a non-slip top. Ahhh, foam rollers. I can just feel my muscle tension being relieved even thinking about using a foam roller. Besides helping to ease tightness and loosen knots in your muscles after working out, foam rollers can also be used for balance exercises, spine stabilization and core workouts. I love this foam roller. As you can see, you don’t have to spend a fortune to set up your own home gym. These budget-friendly home gym essentials will allow you complete full body workouts without ever having to leave the house! If you’re struggling with losing weight, then the 21-Day Weight Loss Transformation Guide would be great for you. The program teaches you how to lose weight in a realistic, sustainable way. It includes a 21-day meal plan, easy-to-make recipes for breakfast, lunch and dinner, and guides on tackling sugar addiction, choosing the right proteins, carbs, fats and a lot more. If you’re ready to make healthy changes in your life and lose weight, then this is where you need to start. Click here to get started with the 21-Day Weight Loss Transformation Guide.